Hong Shao Rou or better known as Chinese Red Cooked Pork is a comfort food among the Chinese. I have read that this dish is part of the Hunan and the Shanghai cuisines. And one article even mentioned that this is a favorite dish of Mao Zedong that's why it is sometimes referred to as Mao Shi Hong Shao Rou. Anyway, this dish makes use of the pork belly, which I believe is the best part of a pork since it composes of layers of meat and fat meeting each other. It is the most tender and flavorful part of a pork. However, next time, I will try to use the pork loin to minimize my husband's intake of fat. The meat in this dish is seared until it is turned brown and braised in a spicy-sweet sauce. The sauce is made of soy sauce thus simmering the meat in it gives the pork it's red color. That's the explanation of the dish's moniker. The dish is somewhat between a pork adobo and a pata tim or asado, kind of. 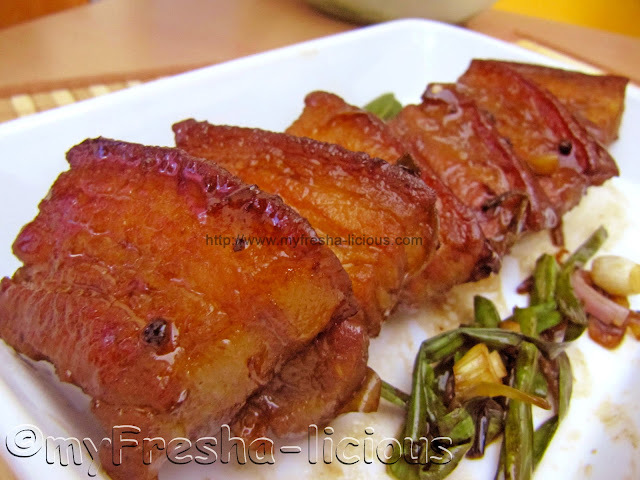 Traditionally, Chinese Red Cooked Pork is usually served with a steamed bun or mantau. The steamed bun usually looks like a clam shell, so you put the red cooked pork in between the shells and stuff the whole thing in your mouth. Be careful not to choke :-) Some people, like what I did, serve it with steamed rice and boiled leafy veggies. 1. Under medium fire, sear pork in a pan until all sides are brown and the meat are frying in its own oil. Remove excess oi. Just leave a little enough for sauteing. 2. Add in the garlic, then the ginger, then the onions, black peppercorns, and scallions. Saute under medium fire. 3. Mix the soy sauce, wine, brown sugar, and water together then pour it on the pork. Bring to a boil under medium fire. 4. Reduce fire to low and simmer the pork until most of the liquids have evaporated. Add more salt as needed. Serve with boiled lettuce, bokchoy, or pechay.